The Walt Disney Company has a generic strategy for competitive advantage that capitalizes on the uniqueness of products offered in the entertainment, mass media, and amusement park industries. Michael E. Porter’s model indicates that a generic competitive strategy enables the business to develop and maintain its competitiveness in the target market. Disney’s generic competitive strategy is based on making its products different from those of competitors. On the other hand, the corporation’s intensive strategies for growth are focused on developing new products that suit global market trends. The company grows through innovation and creativity, which enable the business to compete against large firms. For example, the company competes against Viacom Inc., Time Warner Inc., Sony Corporation, CBS Corporation, and Comcast Corporation, which owns Universal Pictures. The Walt Disney Company’s generic strategy and intensive growth strategies address such competitive landscape. Through corresponding strategic objectives and competitive advantages, the entertainment conglomerate manages challenges in its industry environment. This business analysis reflects strategic management efforts. The company’s generic strategy focuses on developing competitive advantages based on innovation in product development. Disney’s intensive strategies are implemented with strategic objectives for maximizing the growth benefits of such innovation. For example, the company grows by introducing technologically enhanced products, such as movies for customers in the international market. In the context of Michael Porter’s model, The Walt Disney Company’s generic competitive strategy and intensive growth strategies are aligned for product-focused development. Disney uses product differentiation as its generic strategy for competitive advantage. Michael Porter’s model states that this strategy involves unique products offered to many market segments. For example, the corporation offers its entertainment products to practically every person in the world, especially with the core emphasis on family-oriented programming. In this generic competitive strategy, quality and uniqueness through innovation differentiate the company’s products from competitors. The subsidiary Walt Disney Imagineering Research & Development, Inc. has dedicated teams to ensure the uniqueness of entertainment experiences in the company’s theme parks and resorts. The company’s intensive growth strategies and associated strategic objectives are applied alongside this generic strategy, with emphasis on differentiated competitive advantage to support and manage business growth. The Walt Disney Company’s generic competitive strategy pushes for product-focused strategic objectives. Such business focus is necessary for supporting product development efforts to differentiate the company from competitors. For example, the strategic objective of developing new augmented reality products adds to the uniqueness of the Disney experience. Based on this generic strategy, another relevant strategic objective is to strengthen competitive advantages through marketing strategies that reinforce the uniqueness of the company’s brand. These marketing strategies are part of Disney’s marketing mix or 4Ps. Also, related managerial efforts contribute to the achievement of Disney’s corporate mission and vision statements in the global market for entertainment, mass media, and theme park products. Brand uniqueness helps in achieving industry leadership. Considering the differentiation generic competitive strategy in Porter’s model, intensive strategies must involve differentiation to grow the business. Product Development (Primary). Product development is The Walt Disney Company’s primary intensive growth strategy. This strategy involves offering new products in the company’s current or existing markets. For example, the company releases new movies with corresponding merchandise to generate more profits from its target customers worldwide. This company analysis also sheds light on the importance of Disney’s organizational structure, which provides the organizational design to effectively manage product development. This intensive strategy links to the differentiation generic competitive strategy in emphasizing uniqueness in product development. A related strategic objective is to achieve business growth by effectively persuading customers to purchase Disney’s products on the basis of their unique attributes, such as in entertainment experience. Market Penetration (Secondary). 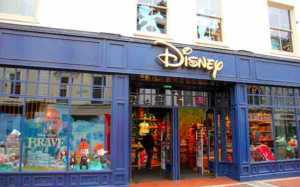 The Walt Disney Company achieves growth partly through market penetration. As a secondary intensive strategy, market penetration enables growth by increasing sales of existing products in the company’s current markets. For example, one of the corporation’s strategic objectives is to use aggressive advertising to increase its revenues from products released in the global entertainment industry. The business strengths shown in the SWOT analysis of Disney contribute to success in implementing this intensive growth strategy. A strong brand based on the differentiation generic strategy creates competitive advantage to attract customers to the company’s products, and to manage customers’ expectations. Market Development. Market development is an intensive growth strategy that is less frequently used in The Walt Disney Company’s business. In growing the business, this intensive strategy requires the company to introduce its existing products to new markets or market segments. For example, growth is achieved by establishing operations in new markets, such as through a new Disneyland amusement park to capture a regional market. Even with competitive challenges, entry into new markets can increase the company strengths to manage the industry’s competitive forces shown in the Porter’s Five Forces analysis of Disney. A key strategic objective in market development is to use the differentiation generic competitive strategy to successfully introduce the company’s products into new markets. Diversification. The Walt Disney Company uses diversification as a supporting intensive strategy for business growth. Developing or acquiring new businesses is the typical approach in this intensive growth strategy. For example, through the establishment of the Disney Cruise Line, the company grew by entering the cruise line market of the tourism and hospitality industries. The differentiation generic strategy develops the competitive advantage of new business operations that use the company’s brand. Under diversification, a strategic objective is to manage competitive challenges by developing new businesses that grow the company’s presence and brand popularity in the international market. Ouma, G., & Oloko, M. (2015). The relationship between Porter’s generic strategies and competitive advantage. International Journal of Economics, Commerce and Management, III, 6, 1058-1092. The Walt Disney Company – Annual Meeting of Shareholders. The Walt Disney Company – The Walt Disney Company To Reorganize Strategic Planning Division. The Walt Disney Company – The Walt Disney Studios Moves To Increase Its Disney Branded Output Strategy.